Location: Situated at Brawdy Farm, some 500m S of Rhydygele crossroads, which is some 1.5km NE of Penycwm. 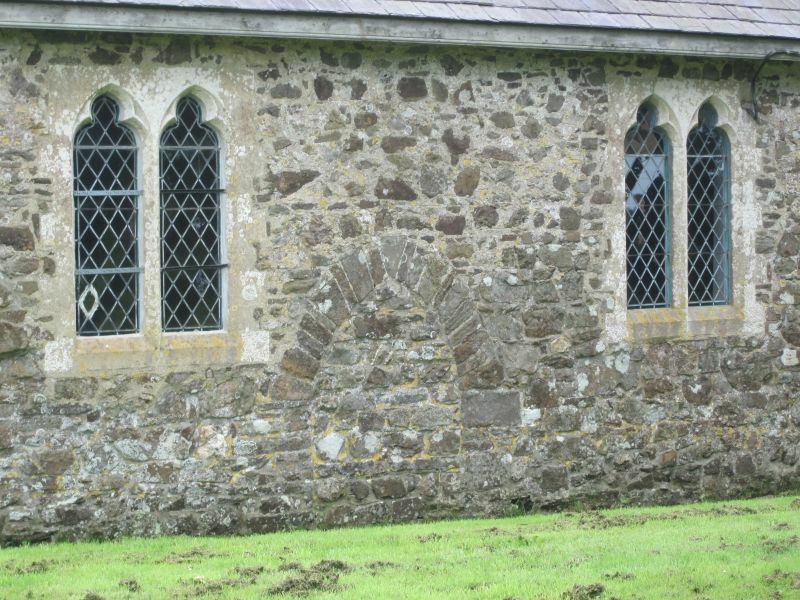 Medieval parish church, posibly C14, rubble stone with slate roofs. Restored 1882-4 by E H Lingen-Barker, and E window 1904 by W D Caroe. Nave with W bellcote and S porch, S aisle and chancel. Long low proportions. Nave has C19 2-light W window with quatrefoil and bellcote. Nave S is windowless to left with large S porch in angle to aisle, rough stone pointed arch, plastered vault within. Nave E gable suggests a previously higher roof pitch and has small sanctus bellcote. S aisle overlaps nave and chancel and has two medieval 2-light S windows, cusped possibly C14 (moved from E and W ends of main church) and C19 2-light E window. Chancel is windowless to s, and has big 1904 ashlar 3-light E window with segmental arched head, and tiny medieval N cusped lancet. Nave N has 3 C19 2-light windows, cusped lancets, and blocked low pointed central door. Whitewashed and plastered, nave roof is segmental-pointed and boarded. Square C13 scalloped font with darts and circular shaft. Plain panelled wood early C19 pulpit. By S door, a C5 to C6 incised stone. In wall to s aisle a narrow medieval lancet, originally external, showing that the aisle is added, possibly in C15. Plastered arches to chancel, into aisle from nave, and from chancel, the latter tudor-arched. two rough stone corbels for former rood-loft. S aisle has boarded roof and early C20 closed screen to cut off E end as vestry. Row of rough corbels along N wall. Chancel has panelled curved late C19 roof, early C20 prayer desk and kneeler, C19 iron altar rails. Stained Glass: W window of Christ in the Temple and E window of Resurrection, both of 1904 by Powell of Whitefriars, London. In porch are three large C5 or C6 inscribed stones with Ogham marks or Roman lettering, the inscriptions very eroded. Situated facing W, to NE of house. Situated some 600m E of Penycwm, approached by track running NE from the Erw Lon estate. Llethr was owned by the Thomas family in early C19, David Thomas died 1823.